Frome’s new Car Club is launching at the Cheese and Grain car park on Sunday 8th February, offering free test drives between 12.00 midday and 3.00pm. 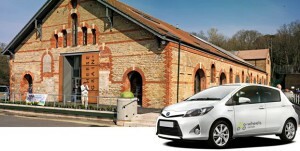 Two electric vehicles (partly solar-powered) and a hybrid vehicle will be available for hire from 8th February onwards. Cars will be located at Frome Medical Centre, the Cheese and Grain and St John’s Church car park. With 24/7 keyless smartcard access, cars can be booked from just 30 minutes, up to a day, a weekend or more. Tariffs are simple and cost effective – you only pay for what you use. Car clubs elsewhere have found that members can save around £3500 a year compared to running a private car, as well as displacing 20 privately owned vehicles per car club car – freeing up car parking space, reducing traffic and pollution. Research has also found that car clubs encourage healthier and safer lifestyles. The club has been started by Frome Town Council, with funding from the Department for Transport via Carplus, in response to local demand. Social enterprise Co-wheels will operate the service. To find out more visit: www.co-wheels.org/frome or call Anna Francis at Frome Town Council on: 01373 475574.